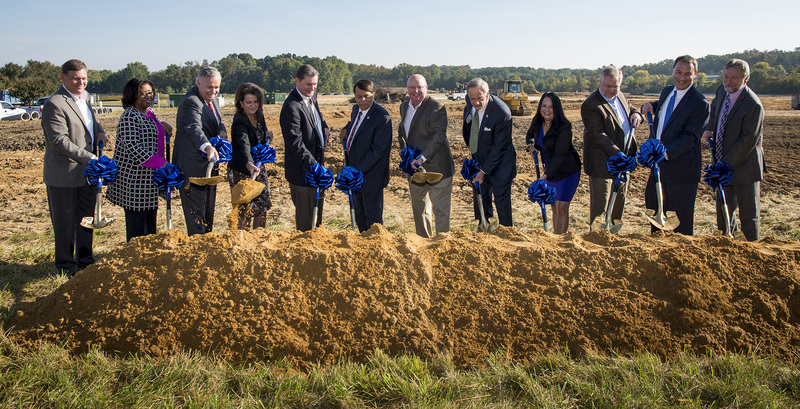 Chesapeake Utilities Corporation held a groundbreaking ceremony for their new Business Campus and CNG fueling station in Dover, Delaware. Pictured from left: Jeffry M. Householder, President, Florida Public Utilities Company and Peninsula Pipeline Company, Inc.; Nicole T. Carter, Assistant Vice President of Customer Care, Chesapeake Utilities Corporation; James F. Moriarty, Vice President, General Counsel & Corporate Secretary, Chesapeake Utilities Corporation; Beth W. Cooper, Senior Vice President, Chief Financial Officer & Assistant Secretary, Chesapeake Utilities Corporation; Stephen C. Thompson, Senior Vice President, Chesapeake Utilities Corporation and Chief Operating Officer, Eastern Shore Natural Gas Company and Sandpiper Energy, Inc.; Robin R. Christiansen, Mayor of Dover, Delaware; Michael P. McMasters, President and Chief Executive Officer of Chesapeake Utilities Corporation; Thomas Carper, U.S. Senator for Delaware; Elaine B. Bittner; Senior Vice President of Strategic Development, Chesapeake Utilities Corporation; Kevin J. Webber, Vice President – Business Development & Gas Operations, Florida Public Utilities Company; Jeffrey R. Tietbohl, Vice President, Eastern Shore Natural Gas Company; and C. James Moore, Vice President, Chesapeake Utilities and Sandpiper Energy, Inc.
Dover, Delaware — Chesapeake Utilities Corporation (NYSE:CPK) (Chesapeake) held a groundbreaking ceremony on October 17, 2016 at its new Dover campus, a 20.6 acre site on South Bay Road. The event was hosted by Chesapeake and attended by state and local officials and company representatives. The new campus will accommodate employees of Eastern Shore Natural Gas Company (ESNG), Chesapeake Utilities and Chesapeake Utilities Corporation administrative staff. The campus will also serve as a Customer Care center for Chesapeake Utilities’ customers and provide a convenient, central location for both customers and employees. Facilities on the new campus, which are projected to be completed in early 2018, will include a 57,000-square-foot office building and a 36,000-square-foot warehouse. Construction of the new campus is expected to provide up to 300 construction jobs. Upon completion of the new facilities, ESNG and Chesapeake Utilities will be able to house operational functions in one building with one central warehouse. Approximately 250 employees will move to the new facility from existing locations throughout Dover. The new campus will also be the future location of the Company’s second Compressed Natural Gas (CNG) fueling station for public use on the Delmarva Peninsula. The station is part of the Company’s ongoing efforts to increase environmental benefits for the local community by supplying clean-burning natural gas to fuel vehicles and partnering with the State of Delaware to increase the number of vehicles utilizing alternative fuels. CNG is a clean burning, readily available fuel and offers cost-savings on fuel and maintenance. CNG-powered vehicles produce lower emissions than gasoline and diesel vehicles, reducing Greenhouse Gas Emissions by up to 30 percent, and NOx emissions by 85 percent. Chesapeake Utilities Corporation is a diversified energy company engaged in natural gas distribution, transmission, gathering and processing, and marketing; electricity generation and distribution; propane gas distribution and wholesale marketing; and other businesses. In total, the Company currently serves approximately 230,000 customers with natural gas, propane or electricity. Information about Chesapeake Utilities Corporation and the Chesapeake family of businesses is available at www.chpk.com. Chesapeake Utilities, the corporation’s Delmarva natural gas distribution operation, serves approximately 71,000 residential, commercial and industrial customers in Delaware and Maryland. 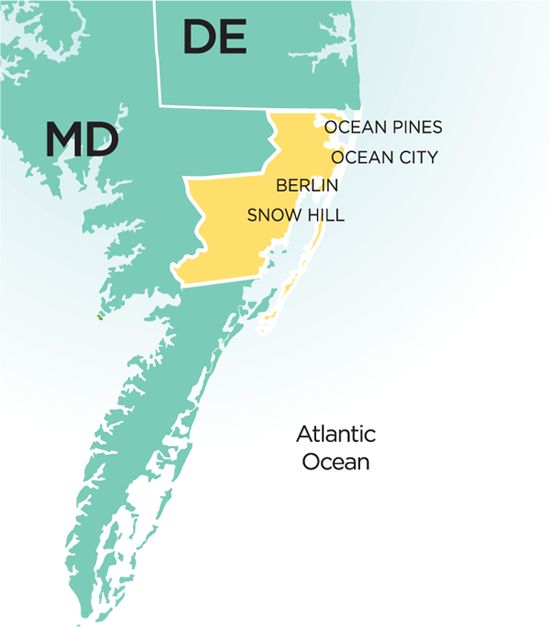 Chesapeake’s Delaware division system reaches southeastward to Milford, Delaware, through several other communities, and reaches the shore in Lewes, Delaware and south to the Delaware state line. Chesapeake’s Maryland division operates on Maryland’s lower Eastern Shore in Wicomico, Dorchester and Caroline Counties, and has recently expanded into Cecil County in northeastern Maryland. Chesapeake Utilities, in Dover, Delaware, operates the only natural gas fueling station on the Delmarva Peninsula. Sandpiper Energy, Inc., a wholly-owned subsidiary of Chesapeake Utilities, provides propane and natural gas through underground distribution mains to approximately 11,000 residential, commercial and industrial customers in Worcester, County, Maryland. Eastern Shore Natural Gas Company (ESNG), a subsidiary of Chesapeake Utilities Corporation, owns and operates a 442-mile interstate pipeline that receives natural gas from three upstream interstate pipeline systems and transports it to local distribution companies, electric power generators and industrial customers in southern Pennsylvania, Delaware and on the Eastern Shore of Maryland. Since the pipeline went Open access in 1997, ESNG has quadrupled pipeline capacity, adding over 180 miles of new pipeline facilities and extending service toward Lewes, Delaware, west to Cecil County, Maryland and south across the state of Delaware. ESNG’s service extends as far as the towns of Cambridge, Easton, Salisbury and Berlin, Maryland.